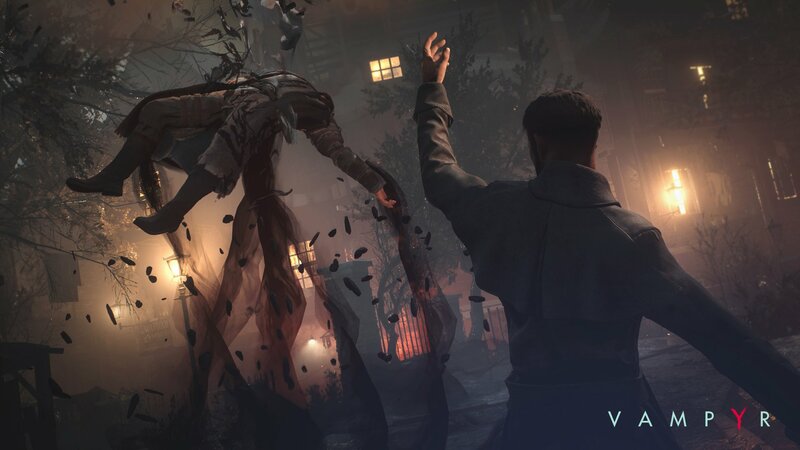 At last year’s E3, Focus Home Interactive’s Vampyr showcase was, by necessity, a lot more conceptual than visual (you know, seeing as how the game was still in the very early stages of development). But as someone who loved Dontnod’s work on Life is Strange, I found myself frustrated trying to imagine all the moral ambiguity and emotional impact that developers Stéphane Beauverger and Grégory Szucs said would be in the game without a longer, more detailed look at the actual mechanics. Well, it’s now a year later, and my wish to get a real feel for how Vampyr works has been granted. My hands may not have been on the controller, but just watching the creators play through a small section of the game was enough to bring it to the top of my most-wanted list. The behind-closed-doors demo of Vampyr showcased just about everything I had been wondering about since I spoke with a couple members of the development team last summer. Most important of those, of course, is the tantalizing main draw: a “semi-open world” full of active, personality-filled NPCs — every single one of whom has connections to certain other people, places and things in the game’s grim, gothic vision of London. Why is that important? Well, as game director Philippe Moreau said during the demonstration, merely defeating enemies isn’t enough to power up lead character and surgeon-turned-vampire Jonathan Reid. At some point, he said, players are going to have to make difficult decisions on who to sacrifice and who to spare … because the benefits of sucking blood are just too compelling and necessary to avoid forever. The 40-or-so minute demo took us through one miniature scenario to give us a good idea of how it all works. In it, Reid meets a man named Seymour who, at first, appears to be little more than a grumpy misanthrope who’s there to make smart comments whenever you walk by. Just a little conversation and a little investigation into his situation (a process which Moreau cautioned would be a lot more extensive and involved in the final release) reveals him to be a murderer who takes lives indiscriminately to calm some sort of inner rage. To make matters more complicated, his elderly mother is hiding up his crimes, refusing to turn her only child into the police. What’s a vampire to do? Well, in Moreau’s case, he had no qualms about having Reid chomp on the poor old lady to get her ample supply of blood (which, as he pointed out, was a lot more plentiful and higher quality than her sickly son’s). An onscreen text prompt, reminiscent of Telltale’s games, alerted us that murdering her would not go unnoticed. And sure enough, once Reid used the “rest” command to apply the blood points he’d acquired towards abilities on several different skill trees, the very next day, the old woman’s house was abandoned and ransacked. And in her bedroom stood Seymour, vowing revenge on the person responsible. Where exactly that will lead, of course, wasn’t shown… but the possibilities are certainly tantalizing. Outside of the ability for Reid to shape the story of London based on who he chooses to maul, Vampyr looks like a pretty standard action-RPG. When in combat, the main character’s moves and weapons are mapped to a set of swappable hotkeys, making it easy to switch up your play style or strategy on the fly. It’s hard to say without actually having control of the character, of course, but I got the sense that the combat in the current build of the game is just a bit stiff; it didn’t quite have the back-and-forth flow and solid collision detection that I expect … but final judgment will have to wait for the full release. Either way, it looks like there are a lot of upgradable options to play around with, from a zoom-warp ability that lets Reid get up close and personal with an enemy in a nanosecond, to a number of long-range projectile weapons and short-range blades. Nobody said this directly, but just based on the time I spent watching the game and listening to Moreau speak about it, I get the sense that — internally at least — Vampyr is the culmination of years of Dontnod’s work in creating morally complex experiences. If Remember Me and Life is Strange let players dip their toes into the water of harrowing, permanent emotional choices, the studio’s latest work doesn’t just allow gamers to jump in … it shoves them into the icy depths from the top of the diving board. With a devilishly cruel and clever main hook, there aren’t any conceptual problems to be found in this Focus Home Interactive-published title — and so all that’s left to see is whether or not the developers’ execution fulfills its immense potential.